When fixing a car strut, the proper tools should be used. The whole unit should be replaced, including the shock absorber, spring, and camber block. Struts are considered a multi function suspension part on every vehicle. Struts are commonly found on front wheel drive vehicles and are becoming more diverse on all wheels of many vehicles. 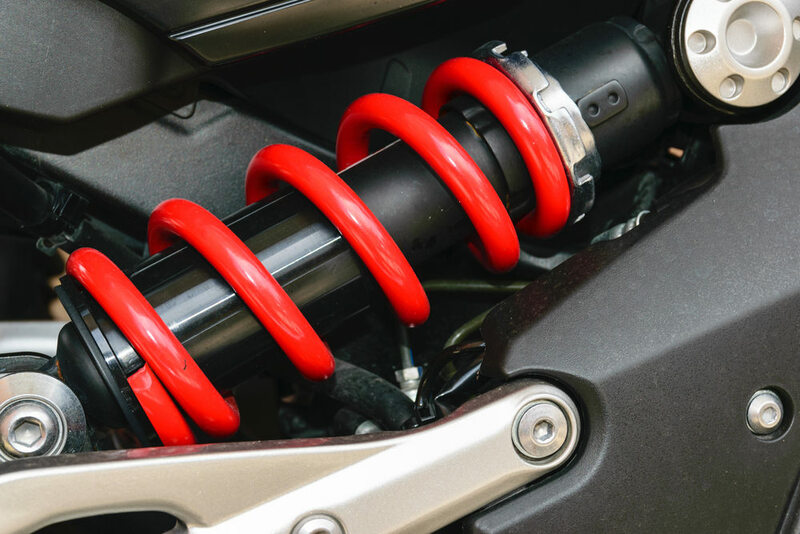 Struts are designed for compact vehicles which cannot support a standard coil spring suspension with an upper and lower control arm. The design of a strut is vital to repairs. When replacing a strut, it is best to replace the entire unit. Warning: Do not attempt to remove the top nut from the strut. This will make the spring that is compressed into place spring out at a forceful rate. You must have the spring compressed prior to removing this nut. It can be tricky replacing a strut on a vehicle. Sometimes the lower control arm ball joint does not free up and is frozen (stuck) to the strut. When this happens, use a sledge hammer and hit the lower control arm area where the ball joint is mounted to and the joint will come apart. When removing the strut camber bolts from the wheel hub bracket, be sure to mark where the strut is located by using a paint marker. Also when replacing struts, make sure that the vehicle is raised on both sides. Like if the front struts were to be replaced, both the front wheels must be off the ground. Both the left and right struts are mounted with extensions to a rod called the sway bar. This bar is made of spring steel and when twisted, the bar naturally wants to return to its normal resting position. With having only one wheel in the air, the position of the sway bar is twisted, making it difficult in removing the sway bar extension. When removing struts from the front wheels of a vehicle the constant velocity shafts must be removed to allow the wheel hub to swing down. This gives room for the struts to be free from any obstacle in the way. Sometimes when removing struts the constant velocity shafts will not move. When this happens, a brass drift is used to punch out the constant velocity shaft from the wheel hub. Note: Do not hit the shaft with a solid hammer or the constant velocity shaft will damage the transmission. Only use a soft face hammer or dead blow rubber mallot. When installing a strut into the front of a vehicle, it can be tricky to align up the lower control arm ball joint. Use a large pry bar to help lift the strut up against the spring and the ball joint will go into place. If the ball joint was not removed to pull out the strut, then aligning the wheel hub to the strut can be tricky for it does not want to align up. When this occurs, just put one bolt in and press the strut towards the engine compartment to align up the other bolt hole. It can be tricky to know where the camber settings were on the old strut, this is why it is important to mark the settings on the wheel hub bracket. Proper camber settings must be placed back into order for the tires to wear properly. It is recommended that after replacing the strut on a vehicle to have a wheel alignment performed to ensure the safety of the vehicle. You will need to have the rear spring mounts and insulators checked to see if they are worn out and need replaced.